Plagron Neem oil is a systemic insecticide and is made ​​from the oil of seeds of the neem tree (Azadirachta indica). The neem seeds are used as active material of natural origin and is very efficient. This drug is so strong that his presence makes even some insects the plants do not touch. This substance kills the insects directly. It will repel insects and their growth and reproductive harm. Use when the sun slowly goes down or when the lights go on indoor cultivation. Squirt but not too much, so the whole plant is covered, and especially in places where insects are. DOSAGE: 4 ml per liter of water. 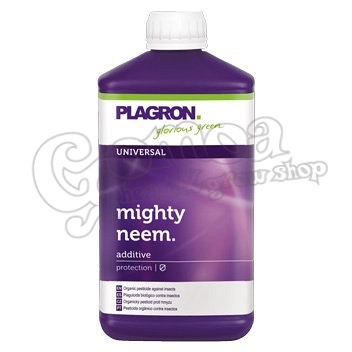 Plagron Neem oil works very good preventative against larvae, eggs, red spiders, aphids, mildew and fungi as woodlice.